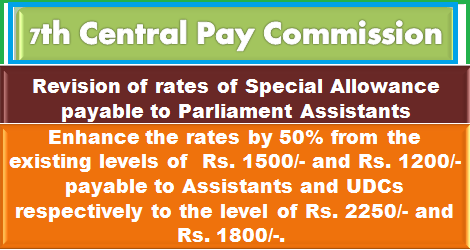 7th CPC: Revision of rates of Special Allowance payable to Parliament Assistants. 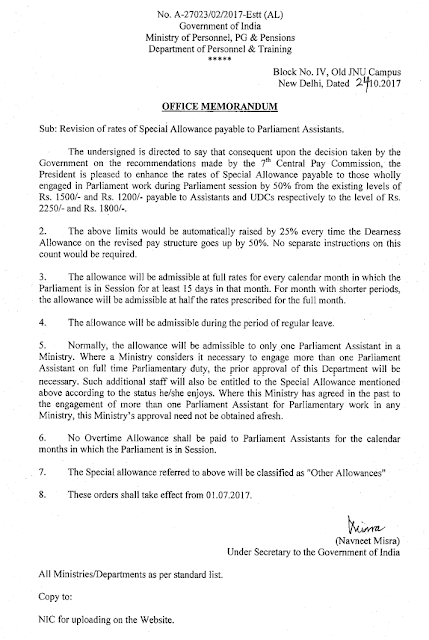 The undersigned is directed to say that consequent upon the decision taken by the Government on the recommendations made by the 7th Central Pay Commission, the President is pleased to Enhance the rates of Special Allowance payable to those wholly engaged in Parliament work during Parliament session by 50% from the existing levels of Rs. 1500/- and Rs. 1200/- payable to Assistants and UDCs respectively to the level of Rs. 2250/- and Rs. 1800/-. 5. Normally, the allowance will be admissible to only .one Parliament Assistant in a Ministry. Where a Ministry considers it necessary to engage more than one Parliament Assistant on full time Parliamentary duty, the prior approval of this Department will be necessary. Such additional staff will also be entitled to the Special Allowance mentioned above according to the status he/she enjoys. Where this Ministry has agreed in the past to the engagement of more than one Parliament Assistant for Parliamentary work in any Ministry, this Ministry's approval need not be obtained afresh. All Ministries/Departments as per standard list. NIC for uploading on the Website. Enhance the rates of Special Allowance payable to those wholly engaged in Parliament work during Parliament session by 50% from the existing levels of Rs. 1500/- and Rs. 1200/- payable to Assistants and UDCs respectively to the level of Rs. 2250/- and Rs. 1800/-.